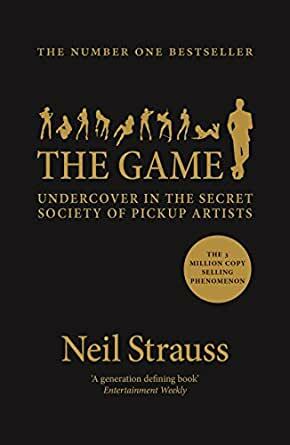 The Game recounts the incredible adventures of an everyday man who transforms himself from a shy, awkward writer into the quick-witted, smooth-talking Style, a character irresistible to women. But just when life is better than he could have ever dreamed (he uses his techniques on Britney Spears, receives life coaching from Tom Cruise, moves into a mansion with Courtney Love and is officially voted the World's Number One Pickup Artist) he falls head over heels for a woman who can beat him at his own game. Not my kind of book. The reason why I read this book was because it's supposedly the book that all guys must read. After years and years of being told this, I was like fine whatever I'll read it. It is definitely an entertaining book. I can understand why this book is controversial. Some of the techniques demonstrated in this book do in fact work because I have used them before. However pickup lines are and will never be my thing. I think with picking up women, you just need to find what works for you. Everyone has 'a game' when picking up women. First half was all about picking up women. Second half got me a bit bored because it was about already being a successful PUA and dealing with the politics, friends, family and other things in the PUA world. I'm not into these kinds of books, but if you're into these kinds of things then this book is for you.